Buenos Aires is the capital of tango, deep-rooted into the customs of its inhabitants. In this city tango is present in every corner, represented by people, places, urban sceneries, ways of dressing and walking. The Tango ritual involves different arts that complement each other, like: musical composition, dance, poetic singing, instrument playing and singing. Each of them has a different origin and evolution. Tango is a popular music non-folk. As in jazz or rock & roll, it is born of the plurality of rhythms brought to America by different ethnical groups. The spirit of its music combines metrics, accents, intentions, rhythms and melodies with the verses of the poems being singed. It is basically ruled by a binary compass of 4/8 . Different from other musical arts that are improvised, the Tango is always previously composed and executed with a previous harmony. 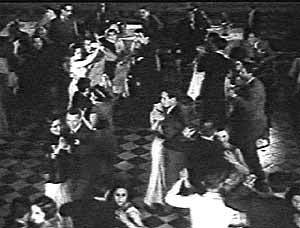 The Tango is a dance of intertwined couples, originally not necessarily a man and a woman, for it was also danced among men only. The most known steps are: el corte, la quebrada, la tijera, la refilada, la sentada, el voleo. 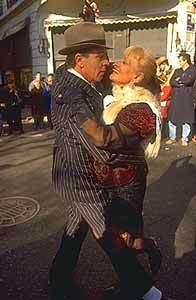 The city offers a wide variety of possibilities for those willing to approach tango. The options depend on the type of activity you want to try. The “Tango Show” consists of a choreography previously rehearsed for the show presentation, while the Tango dancing performed at the local clubs is practiced at a social level without age or social distinctions. These places are not planned for tourists, but if you really want a taste of the Tango essence, this is were you should go. Las Milongas are clubs or dance halls full of fun and life where people dance tango and where occasionally a show takes place. Is were “porteños” dance the 2x4. There are many of these throughout the city, with every day dancing and at different hours. Some of these places offer tango lessons, usually 2 hours long, and then you can dance till the late hours of the night.. These lessons will teach you the basic dancing steps. In order to dance you better know the basic steps to avoid stepping on your partners toes. Milongueros are very simple people but with high standards with their art. The most experienced and stylish men are the most seeked for. Women usually exceed the number of men, for their part is simpler, they just follow the man’s lead. If you are not ready to step into the dance floor, you can just have a drink or something to eat, while you watch the couples dance. The tables are strategically placed around the dance floor.